It didn’t take long for Derek Carr to prove his worth after being selected with a second-round pick by the Oakland Raiders in the 2014 draft. He showed rapid improvement in his overall PFF grade from 2014 (55.5) to 2015 (87.0), which he maintained into 2016 when he posted a top 10 overall grade of 87.3 and helped the Raiders end their playoff drought. Raider Nation was ecstatic to finally have an apparent franchise quarterback to build around while the organization rewarded him with what was then the largest contract in NFL history. Despite the solid 2016 season that saw the offense rank towards the top of the league across the board, a first-time offensive coordinator was inserted to run the show and was unable to bring the offense to greater heights in 2017. Carr finished the season with a 77.7 overall grade, ranking 21st out of 39 qualifying quarterbacks. His newfound struggles mirrored that of his team, as both took a step backward, limping to a 6-10 record. While there will be many new pieces in Oakland in 2018, Carr will need to return to his pre-2017 form if they want to make the playoffs under new head coach Jon Gruden. Conversely, the team will need to also revert to its old form if they want to assist their quarterback. Fortunately, for the Raiders and their young quarterback, his struggles from 2017 seem to all come by way of unstable metrics that have a high variance from year-to-year, signaling he may be able to bounce back in 2018. For the second consecutive season, Oakland’s offensive line ranked in the top three in pass-blocking efficiency, so there was no significant drop off up front to blame. They finished with the 12th-highest grade in run-blocking, sparking their mediocre rush game, ranking 16th in rushing grades as a unit. So if not the offensive line or the run game, is there anywhere else we can attest portions of Carr’s struggles? Diving further into PFF’s database, a troublesome trend continued among his wide receivers. 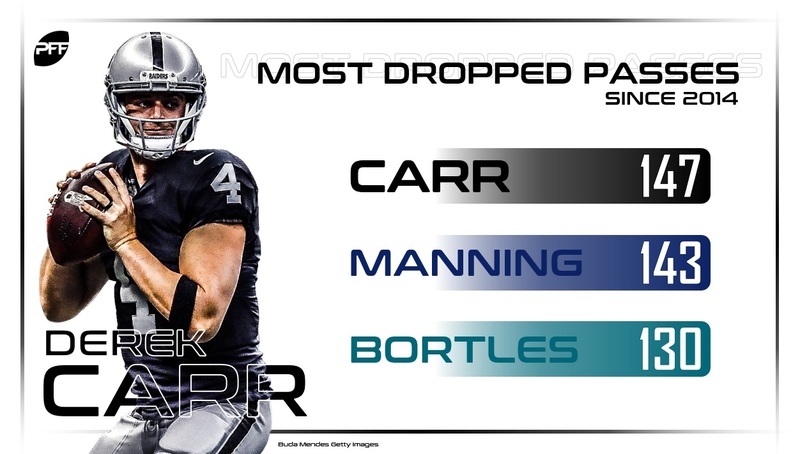 For the second consecutive year, Carr was victim to dropped passes. To be exact, he had the second-most dropped passes (35) in 2017 after leading the league in such in 2016 (37). In fact, the team posted the third-worst cumulative PFF receiving grade over the 2017 season. His drop rate of 6.8 percent was the sixth-highest in the league as Amari Cooper (10), Michael Crabtree (6) and Seth Roberts (4) combined for 20 drops on the year. Cooper finished the year with the league’s fifth-highest drop rate at 17.24 percent, allowing his 10 dropped passes hit the dirt on 58 catchable passes. Drop rate in and of itself is an unstable metric, so for Carr to finish in the bottom third in each of the past two seasons only signified that changes to the receiving corps needed to be made. The Raiders have attempted to fix their case of the drops by letting Crabtree go and bringing in former Packers WR Jordy Nelson, former Steelers WR Martavis Bryant and former Cowboys WR Ryan Switzer. Nelson and Bryant combined for just six drops a year ago. Mining PFF’s quarterback data even further shows that Carr’s biggest struggles came by means of unstable year-to-year metrics: under pressure and red zone efficiency. When under pressure, Carr put forth a 40.8 passer rating – ahead of only DeShone Kizer among all qualified quarterbacks. As unstable a metric as it is, his play under pressure did him no favors a season ago. He finished 2016 with a 70.0 passer rating under pressure, good enough for 18th among quarterbacks, showing just how much variance can occur between years (a 29.2-point jump from 2016 to 2017 is the largest jump among 29 qualified quarterbacks over that span). Carr lacked those game-changing throws where it mattered most as well in 2017, as he averaged a passer rating of 87.9 (league average was 92.6) on throws inside the opponent’s 20-yard line. He also posted his lowest percentage of big-time throws since his rookie season, ranking just 34th of 41 qualified quarterbacks and had the highest turnover-worthy play percentage of his career at 4.1 percent, 29th in the league. Carr also struggled mightily on third down where he had more turnover-worthy throws than big-time throws. Diving even further, from PFF’s QB Annual, Carr finished second in accuracy percentage on tight-window throws in 2016 at 48.0 percent. In 2017 however, he fielded an accuracy percentage of just 37.1 percent on the same throws, finishing 29th. 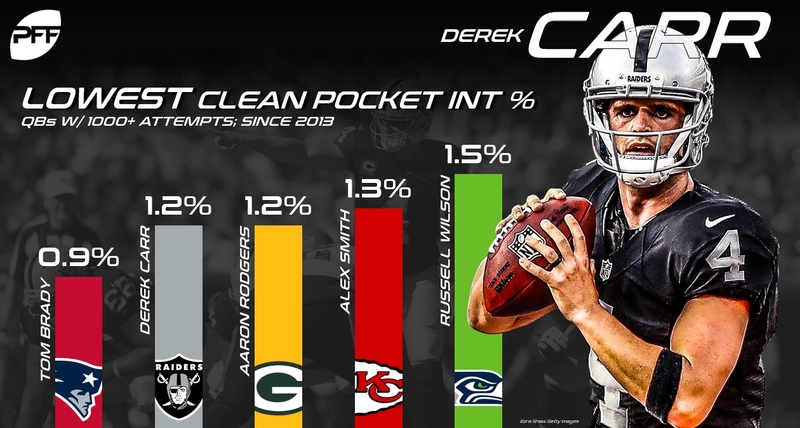 His struggles aside in 2017, Carr did continue to excel in an area he has since he entered the league, getting the ball out of his hands quickly and generally avoiding sacks. His 2.40-second average time to throw tied him with Eli Manning for the quickest release in the NFL last year. Additionally, Carr continued to be effective and turnover-averse when given a clean pocket, a much more stable metric than play under pressure. Since 2013, only Tom Brady has a lower interception rate from a clean pocket than Carr. Seemingly having noticed the effect a clean pocket has on Carr, Gruden and Co. invested two of their first three picks in the 2018 NFL Draft on offensive tackles, emphasizing the need to keep Carr protected. While his 2017 season saw its struggles, Carr is ultimately only one season removed from ranking in the top half of the league in virtually all of the aforementioned statistics. Creating hope for Raider Nation, if Gruden can implement his new system to take advantage of Carr’s undeniably valuable skillset, his franchise quarterback could get rolling again in 2018 and beyond.